After the excess that was Easter, tonight I really had a craving for something that at least looked healthy even if it was full of things that I shouldn't eat. I suffer from a condition called Endometriosis. It's not something that should be discussed on a food blog - but if you want to read up on it, there's plenty of info on the web. In turn, it causes me to be anaemic. Which is why I tend to go through phases of lurgy after lurgy after lurgy. I'm not even trying to be smug and flippant here but I can safely say that I've probably eaten everything in the exclusion list this weekend except for fried foods. I did manage both fruit and veg but that's about it from the top list. I'd love to be able to adhere to the diet and maybe my next challenge once I've finished this year should be to do the endo diet and stick to it, rather than whining on about all the nasty pain and side effects. And if I stopped baking so much, I'd do really well on the no wheat, no dairy, no eggs, no sugar front. One thing I do try to do is maintain my iron levels. My mother keeps threatening to force feed me liver when I go to visit because I rarely eat red meat when I'm at home. To compensate, I've started taking an liquid iron supplement which seems to help - I got a sample of it in my goodie bag after running the Bath Half Marathon last month and it's much more tummy friendly than the stuff the NHS prescribe. 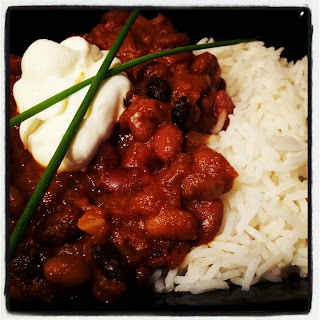 I'm also looking at ways to eat more beans and pulses - hence tonight's recipe of choice which was on the BBC Good Food website under their Iron Rich Vegetarian Recipes section. It was an interesting recipe - using Spanish paprika rather than regular chilli. This, in conjunction with the cumin and cider vinegar gave it a really nice flavour range. Since starting this blog, I've been paying more attention to all the little bursts of flavour you get from the different herbs and spices etc and although the odd hit of a sour taste of vinegar was a bit weird at the start, I have to say that it really worked. Rather than using just black beans, I had a tin of mixed beans from Asda. I don't normally shop there but was pleased with this find as most tins of mixed pulses also include chickpeas which don't always work well in some dishes. This dish would've been one of them in my opinion. Do pay attention to the advice to cook the tomatoes for a while first as I missed the bit that said to wait ten minutes before throwing in the beans and consequently found it a little watery. And of course, I served it with white rice - naughty - but life is too short to boil brown rice. Seriously. It seems to take forever! Will definitely be making this again on a regular basis. Warming, filling and packed with iron. And I'm sure it would be really nice with some chopped chorizo thrown in too.